Since the Internet era began people started migrating from flash to browser-oriented games. The reason for this is mainly the multiplayer option these games have. One of them is Shell Shockers, which is yet another really popular .io game. As with any other game, there are better and worse players at this one. Hopefully, this article will help you to get a lot better at cracking those eggs! As you may already know, having a high ground in a lot of games will give you an advantage over other players. For example, if you’re on that map with a lot of stairs and floors, always try getting on the top floor. You want to check for the stairs beneath you for the enemy players. The higher ground will also allow you to throw grenades a lot easier – giving you an opportunity to get some kills without taking any risks. Also, keep in mind that people can spawn anywhere, so keep looking around you too, not just beneath you! Maintaining the high ground will also allow you to control snipers – which is a big plus if you can eliminate them from the high ground. Doing this will give you a lot more control of the game. The very basic, yet important tip for every single gun, but especially shotgun: RELOAD! I see this problem with a lot of players in many different games. People will often forget to reload and get killed because they will run out of bullets in a fight. Bonus tip for the shotgun: try cutting corners and surprising people. This will give you a huge advantage over other players since they won’t expect you killing them behind the corner in one blow. Another thing you should consider is moving while a sniper is shooting at you. Obviously, if you’re standing still you will get shot most of the time – and since the sniper will kill you with just a single shot, moving all the time will help you eliminate this risk. If you’ve ever played fps games, you probably know what shooting the enemy player’s head will do the most damage. This is not the case with Shell Shockers. 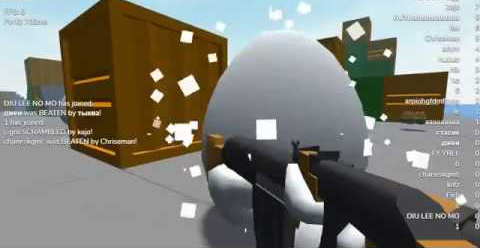 To deal the most damage to the enemy, you will have to shoot the center of the egg. This will massively increase your damage output and take down enemies a lot faster. On big and confusing maps, you want to stick to a certain pattern of gameplay. You can use a certain technique I like to call “Hit and Run”. Basically, what you want to do is to wait for a big fight to happen and then join it. Try to pick someone off as fast as you can and then escape to the tunnel to reload and to change your position. In terms of range, the sniper has the longest one obviously. You want to use the EggK-47 for the mid-range fights and shotguns for when the enemy is really close to you.